This book is probably the cutest book that I have read all year long. I loved every single second of Hannah and Nick's story. Jessica Love is an author I will be keeping my ears open for, because when I need a good, sweet story, I am running straight to her books! Hannah and Nick have been best friends for four long years. They know everything there is to know about each other. They talk to each other first thing in the morning, and before bed. When they need someone, they turn to each other. And now, Hannah finally realizes that she just might be in love with Nick, and it doesn't matter how scary it is anymore, she has to tell him. The only problem? They have never met each, and he lives hours away. After a spring break trip gone wrong, Hannah (who is the queen of following the rules and being a good girl), decides to road trip to Las Vegas with her BFF and sister, and surprise Nick. And finally tell him how she feels. But when they arrive at the show where Nick's band is the opening number, things immediately go wrong. Lies will come to light, and a night of embarrassment, anger, fear, heartbreak and hope ensues. The cuteness starts the minute the story begins, and it never lets up. From the decision to go to Vegas, the car ride, and the crazy night they spend in Sin City, my love for this book only grew. Hannah is a great character. She is the ultimate teenage girl. She makes bad decisions, she is selfish sometimes, but she is a teen girl through and through. I loved her and rooted for her. Nick was the cutest, most awkward guy! He stumbles over words, doesn't always have the perfect thing to say, and yes he has told some pretty big lies. But he owns up to it all, and I could understand his reasons. Being a teen, boy or girl, isn't an easy thing. And being in love with someone and not knowing if they feel the same, or believing that they don't, makes you do some crazy things. Every single secondary character in this book is a major player in their own rights. They each have a role to play, and the book wouldn't have been as good without them. I am wholly impressed by Jessica Love's ability to create such believable characters. 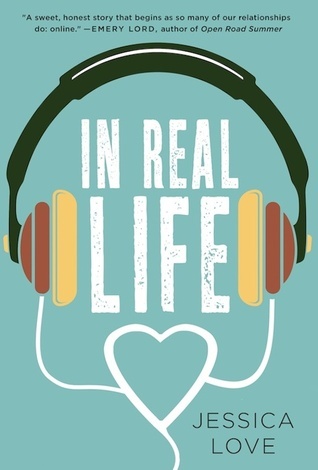 In Real Life is easily one of my favorite contemp/romance stories of this year. From the awesome setting of Las Vegas, and the wonderful characters, to the feels galore, Jessica Love's story will appeal to readers of all ages. I might be a 33 year old woman, married and happily so, but the feeling of first love is still something that brings a smile to my face! Go ahead and pre-order this one. It is a story that you don't want to miss!! This sounds so cute! It was one of your favorite contemporaries of the year? I'm adding it to my TBR. Thanks Jaime!